The Hunter QuietFlo 245 is an great air cleaner. It is designed to clean medium rooms. It will clean a 225 square foot room. 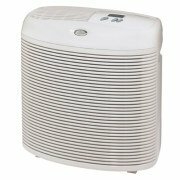 This is a great air purifier to put into a master bedroom, home office, or den. It retails for $195. Like the rest of Hunter air cleaners, the QuietFlo 245 uses a HEPA filter. It is capable of removing up to 99.97% of air born particles 0.3 microns and bigger from the air. This will remove dust, dander, pollen and most of the common allergens. We think HEPA filters are the best air purifier filter. There is also an activated charcoal, or carbon, pre-filter. Activated carbon is good for removing odors and chemicals. We don't think there is enough activated carbon to do an effective job. For serious odor removal think about an air purifier by Austin Air, IQAir, or AllerAir. This model has a couple filters that must be replaced. The pre-filter has to be replaced every 3 months. They cost about $28 for a two pack. They are good for 3 months. The total cost a year then is $56 for pre-filters. The Hunter HEPA filter is good for one year. It's $60 to buy a new one. So the one year cost is about $116. The Hunter Quietflo 245 can be programmed. It will automatically change the fan speed up to 4 times a day, 7 days in a week. This will clean up to 225 square feet. That's a room 14 feet X 16 feet. In a room this size this air purifier exchanges the air 6 times. It has a 3 speed fan. If you want whisper quiet use the lowest speed. Not the two higher speeds. This air purifier measures 17.5 inches X 8.3 inches X 19.5 inches (L X W X H). It comes with a 5 year warranty on the motor. There is a 1 year warranty on the grill and cord. This is a good air purifier to use in a medium sized room. We like the HEPA filter. It will remove most allergens. We don't like the carbon pre-filters. We think there is not enough carbon to do an effective job removing odors and chemicals. It will still prevent larger particles from clogging up the HEPA filter. If odors are not a concern for you the Hunter QuietFlo 245 will do a good job. We feel the maintenance cost is still a little high. We think that $116 a year is a lot to pay for replacement filters. This is less than the QuietFlo 90 or 85, but still a lot to pay in our opinion. Overall, this is a good air purifier. It will work well and you will be able to breathe cleaner air. So asthma and allergy suffers will be able to breathe easier. Leave Hunter QuietFlo 245 Page and Return to Hunter Air Cleaners Page. Leave Hunter QuietFlo 245 Page and Return to All About Air Purifiers Home Page.